Yoga Journal, Sept/Oct. 2005, "Green Acres: Help renew the environment on your next vacation"
Michigan Today, June/July, 2004 feature article on "lifestyle migration," "free agency," and the "rural renaissance." Milwaukee Journal Sentinel, January, 2005, "Inn opens doors to the 'good life'"
Vegetarian Times, May, 2005, "Living Green"
For samples of John and Lisa's presentations, or for more information about inviting them to speak at your event, conference or gathering, click here. 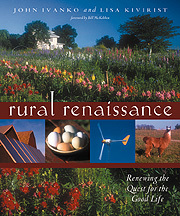 Order your copy of RURAL RENAISSANCE at a 22% discount off list price from Inn Serendipity (a PDF file order form). Copyright © Rural Renaissance Network. All rights reserved.